15/16" Sterling Silver St. Sebastian Baseball Medal made in the USA. 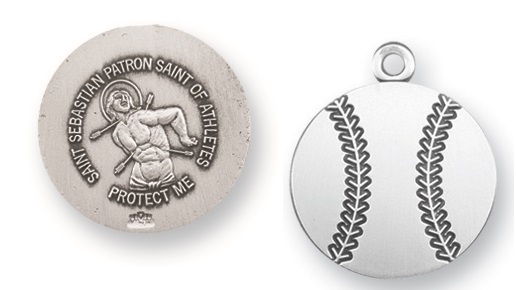 The Baseball shaped Medal is adorned with St. Sebastian the Patron Saint of Athletes. This Sterling Silver St. Sebastian Baseball Athlete Medal is made in the USA. 1 3/8 x 3/4-inch solid 14K gold large Miraculous Medal, perfect for those who want to display their devotion to the Blessed Mother in a big way. This Catholic pendant comes with a premium keepsake jewelry box. Rest assured that this item will last for many generations, and it even features our Lifetime Warranty. 1 x 3/8-inch Gold-Filled (14K) St. Francis Medal, expertly crafted in the USA for a lifetime of use. White Shell Natural Stone Cross Necklace 26"
This 1-inch White Shell Natural Stone Cross Necklace 26-inch is from the renowned Goldscheider collection. Our Adult Pewter Celtic Cross bangle bracelet has a charm that we can engrave for an extra fee and features our money-back guarantee. 5" San Damiano Cross Gold Leaf Stamped. This San Damiano Crucifix Gold Stmp features the CatholicShop.com money-back guarantee. These cute, cuddly St. John Paul Ii Holy Bears make a great gift. Each bear is about 9 inches tall from head to toe and made of only the highest quality fabrics and embroidery. Ages 3 and up only. This Sterling Silver St. Sebastian Baseball Athlete Medal has passed our quality control assessment and meets our strict criteria to be a Catholic Shop product. Buy with confidence.